The question recently came up in my congregation about the lack of a U.S. flag in the sanctuary of the church. I did not remove it; my predecessor actually did it years ago, before I was called to my current congregation. And I support his decision to do so. Of course, this was not a popular decision at the time. But pastors are not called to be popular. And for people who simply want what they want, and who stop up their ears to any explanation, they will simply choose to be angry. They may even pass along veiled (or not so veiled) accusations of evil motives. And yet even though I did not always agree with my predecessor in liturgical matters, I know he had no evil intention in making this decision - a decision that had the unanimous concurrence of the Board of Elders. Everything in the church is about Jesus. Everything in the sanctuary points us to Jesus. Art is a powerful communicator of Christ and the Gospel - from the candles (representing the Light of Christ, the Light of the World), to the linen-shrouded altar (representing the empty tomb), to the baptismal font (often eight-sided pointing us to the eight people saved through water in the ark), to the stained glass windows depicting events in the life of our Lord and of the church, to statues and paintings, even to the plants and flowers (reminding us of Eden and of "the Lord and giver of life," everything in the church points us to the Father, Son, and Holy Spirit, and ultimately to the restored communion with the Triune God won for us by the atoning sacrifice of our Lord Jesus Christ. The pastor's vestments, the symbols sewn on them and on the paraments, the colors used in the course of the year, the advent candles, the art depicted on banners, all point us to Jesus. Crosses and chi-rhos, alphas and omegas, images of nails and crowns of thorns, even the dignified precious metals used in the communion vessels communicate the holiness of the sacramental reality of the Lord's presence. Some might argue that Christmas trees and poinsettias and lilies that adorn our chancels are exceptions to this rule, but not so. The Christmas tree is a tree - symbolic of both the Tree of Life in the Garden of Eden, as well as the Tree of the Knowledge of Good and Evil from which comes all death and misery. The Christmas tree symbolizes both the manger (the rough-hewn cradle of the Christ child) and the cross (the tree upon which the cursed Man is hanged). Poinsettias and lilies are both plants that are at the height of their beauty during the holy seasons of Christmas and Easter. There is nothing more natural and Christ-centered than to bring the beauty of life at the fullness of its vitality into the place where eternal life is given by grace! The lily, in particular, is sometimes manifested (especially in my region) as a fleur-de-lis. It is a symbol of Louisiana's French heritage because it is a religious symbol of a people steeped in the Christian faith. The lily is often symbolic of Easter and the resurrection, also the Blessed Virgin Mary, as well as the Holy Trinity. It is a symbol of the football team called the Saints because it was first a symbol of Christian sainthood, that is, holiness. Similarly, the pelican appears on the state flag of Louisiana, not only because these creatures are native to our state, but also because the pelican is a venerable symbol of Christ, based on the medieval fable of the mother pelican giving her life to feed her brood with her own blood (see also LSB 640, stanza 3). The symbol of our region is so because the people of our region have an ancient Christian heritage. The Fleur-de-lis and pelicans have been used in Christian symbolism and art for centuries. There is a rich and deep christology and Trinitarian confession made with these symbols. So where do national flags come into all of this? In the vast majority of churches around the world, you will not find a national flag. Visitors to the U.S. are sometimes shocked to visit churches and find flags adorning the sanctuary. It sends a mixed signal about what Lutherans refer to as "the two kingdoms" - that is, the Church (the right hand) and the State (the left hand). In some European state churches, there is a mixing of the two to the point where in England, the head of the Church is the Queen, and where until recently, in Sweden, pastors were paid out of compulsory taxes. 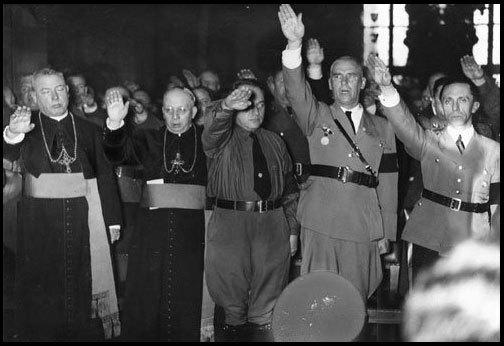 Some brutal regimes forced flags into the churches, such as Nazi Germany, which compelled churches to display the desecrated cross of National Socialism - which was essentially a competing religion of state-worship. Sadly, many clergy fell for this false religion and its symbols. Modern Roman Catholic churches do display the coat of arms of the pope - which so happens to be the national flag of the Vatican. This probably explains why Roman Catholic churches in the United States do often display U.S. flags - as it is a breach of U.S. etiquette (according to the flag code) to display a foreign ensign without a U.S. flag. Here in New Orleans, the St. Louis Cathedral in the French Quarter - a historic landmark and tourist attraction - actually displays dozens of historic flags that flew over New Orleans - including the official governmental flag of the Confederate States of America. And even though I enjoy history and have an affection for the Stars and Bars and other symbols of my heritage, I believe none of these flags have a place in a Christian sanctuary. The Cathedral has an impressive history, but its most important historical connection is to the body and blood of Christ that are physically present on the holy altar - all other history pales in comparison to Him whose incarnation is why we number our years Anno Domini. The practice of displaying the U.S. flag in Lutheran churches is a recent phenomenon - and it began because during the World War I era (and again during the Second world war) mainstream Americans were harassing ethnic Germans, and the German Lutherans felt compelled to abandon their German language and heritage and to try very hard to show their American patriotism - partially out of fear of being terrorized - as the U.S. was at war against Germany twice in the last century. “To the best of my knowledge, the U.S. flag began appearing in our churches in response to two things: the desire to express an unquestioned loyalty as U.S. citizens (a reaction to WWI sentiment) and the growing sacralization of the flag in U.S. culture. In the history of my home congregation (Immanuel, Bristol, CT), the story of the responses to both WWI and WWII is given in some detail. However, the picture of the church after the renovation in 1948 does not show a flag. There was a flag on the grounds between the church and the school, and it was raised and lowered with considerable ceremony when school was in session. I think that is one response evident in many congregations: we could show our loyalty in many ways without placing the flag in the church; other congregations seem to have brought it into the building itself, with great debate about the proper location (nave, chancel, narthex, etc.). “Non-Americans are often astounded to see a national symbol in the church (perhaps they have memories of the Nazi flag being touched to the altars of German churches). Obviously, the inclusion of the American and Christian flags is widespread in the LCMS. As Professor Schmelder mentioned, this probably developed out of the desire of congregations of prominently German-American heritage not to appear German during and after the world wars. Likewise, many veterans of those wars returned with great patriotic zeal, which probably manifested itself in the desire to display “Old Glory” in the sanctuary. Today, however, it may be time to reconsider this short-lived tradition among us (Lutherans never did this prior to WWI, and then only in America). One may observe that many congregations today, when considering a sanctuary renovation or even building a new sanctuary, will opt to display the flag in a location other than the chancel or nave. Many will place a flag outside of the building proper, or perhaps in the narthex. In such ways, as Professor Schmelder noted, we can demonstrate our patriotism, but not blur the distinction between the kingdom of Christ with the kingdom of the world/government. Our Lord’s words, of course, come to bear on this issue ultimately: “Render unto Caesar the things that are Caesar’s; and render unto God the things that are God’s” (Luke 20:22). Both are good and right … in their respective places and times. Flags are popular in some cultures, and the United States is one of them. Flags evoke strong feelings and loyalty to hearth and home. Soccer fans will often wave flags during matches to show affection for their home countries as they are represented on the field. The same is certainly true in the Olympics. Flags are displayed on houses and in various community displays out of love of country. Flags are so common in the United States that they are beloved and comforting symbols. They appear at sports events, in military or Boy Scout ceremonies, and sometimes even in ways that it could be argued might not be entirely appropriate - such as on decals on cars and on belt buckles. Some people want the flag in the church because they like it. But that fact alone is not justification to include it. I once had a lively debate with a motorcycle-church pastor who argued that it is appropriate to adorn church walls with exhaust pipes and gas tanks. How these things point us toward Jesus, I don't know. There is a difference between a Hard Rock Cafe or a Cracker Barrel (both of which have interesting things hanging on the wall) and a Christian church sanctuary - in which the art exists to point us to Christ. But there is another context and use of flags: a show of jurisdiction. For example, a Kentucky State court will display the flag of the Commonwealth as a confession of sorts, that this court is convened under Kentucky (not Ohio and not Indiana) law. A 1988 movie called Judgment in Berlin is an adaptation of the 1984 non-fiction book of the same name written by a U.S. federal judge named Herbert J. Stern. Stern presided over an unusual case in 1978, held on German soil, but because of the way post-war Germany had been divided up by the allies, this trial was held under the auspices of U.S. law. Juries had been abolished by Germany in 1924, and yet this trial, held in Germany, had to have a jury and be conducted under American law and juridical procedure. The U.S. flag in the courtroom was not a symbol of patriotism or nostalgic feelings of home - it indicated a legal jurisdiction. Similarly, ships on the high seas are flagged and are under the jurisdictions of the flags they fly. Another example of the jurisdictional use of national flags involves embassies. The Saudi Embassy, for example, is located in Washington, DC. But it does not fly the U.S. flag. Embassies are outposts of the countries they serve, and the Saudi Embassy in Washington is actually "Saudi soil" (not sand in Washington!). U.S. law does not apply there. The Saudi flag is indicative of sovereignty and jurisdiction. In a sense, the church (whose space we sometimes call the "nave" - that is, the "ship") is like a ship or an embassy that flies under its own flag. Churches, though located in the U.S. or Canada or Russia or Ethiopia - are actually missions or consulates or embassies of heaven. The sovereign of the Church is not the king or the queen or the president - but the King of Kings, the Lord Jesus Christ, He who said, "My kingdom is not of this world," He who rebuffed Satan's temptations to give Him all of the kingdoms of the world. And in the west, there is a long tradition of ecclesiastical law (canon law) being applied to the church instead of civil law. The controversy between King Henry II and Archbishop Thomas Becket began as a dispute over who had legal jurisdiction over priests: the king or the bishop. Even in funerals of soldiers, the draping on the casket inside the sanctuary is not the national flag, but rather the white baptismal pall. The flag is placed onto the casket only after the body leaves the church and the casket is being prepared to be placed into the grave. There is a liturgical break between the rites of the church and the rites of the military. Finally, it is important to understand that the Church is universal and transcends nation and tribe. The Lord reveals His Church to be from "every nation, from all tribes and peoples and languages." The Church is not contiguous with any national jurisdiction. And Lutheran Christians can traverse the planet and can feel right at home in the Divine Service in the presence of their brothers and sisters in Christ (in the very presence of Christ) even if the language of the Mass is unknown to the worshiper. There is no American Church, German Church, Russian Church, Kenyan Church, or Icelandic Church. There is only one holy catholic and apostolic Church, a "holy nation" that knows no boundaries, but spans the globe and transcends time itself, even unto eternity. Nations will rise and fall - and they have. Kingdoms will come and go - and they have. Flags will be raised and lowered - and they have. But God's kingdom "shall stand forever!"